The United States Marine Corps (USMC) is a branch of the United States armed forces responsible for providing force projection from the sea, using the mobility of the U.S. Navy to rapidly deliver combined-arms task forces. It is one of seven uniformed services of the U.S.. Administratively, the Marine Corps is a component of the Department of the Navy, but it acts operationally as a separate branch of the military, often working closely with US Naval forces for training, transportation, and logistic purposes. Originally organized as the Continental Marines on November 10, 1775 as naval infantry, the Marine Corps has evolved in its mission with changing military doctrine and American foreign policy. The Marine Corps has served in every American armed conflict and attained prominence in the 20th century when its theories and practice of amphibious warfare proved prescient and ultimately formed the cornerstone of the Pacific campaign of World War II. By the mid 20th century, the Marine Corps had become the dominant theorist and practitioner of amphibious warfare. Its ability to respond rapidly to regional crises gives it a strong role in the implementation and execution of American foreign policy. Television”>http://www.himfr.com/buy-Television_Size/”>Television SizeThe United States Marine Corps, with 194,000 active duty and 40,000 reserve Marines, is the smallest of the United States’ armed forces in the Department of Defense (the United States Coast Guard is smaller, about one fifth the size of the Marine Corps, but serves under Homeland Security). The Corps is nonetheless larger than the entire armed forces of many significant military powers; for example, it is larger than the active duty Israel Defense Forces or the whole of the British Army. This last clause, while seemingly redundant given the President’s position as Commander-in-Chief, is a codification of the expeditionary duties of the Marine Corps. It derives from similar language in the Congressional Acts “For the Better Organization of the Marine Corps” of 1834, and “Establishing and Organizing a Marine Corps” of 1798. In 1951, the House of Representatives’ Armed Services Committee called the clause “one of the most important statutory—and traditional—functions of the Marine Corps.” It noted that the Corps has more often than not performed actions of a non-naval nature, including its famous actions in the War of 1812, at Tripoli, Chapultepec, numerous counter-insurgency and occupational duties (such as those in Central America), World War I, and the Korean War. While these actions are not accurately described as support of naval campaigns nor as amphibious warfare, their common thread is that they are of an expeditionary nature, using the mobility of the Navy to provide timely intervention in foreign affairs on behalf of American interests. In addition to its primary duties, the Marine Corps has missions in direct support of the White House and the State Department. The Marine Band, dubbed the “President’s Own” by Thomas Jefferson, provides music for state functions at the White House. Marines guard presidential retreats, including Camp David, and the Marines of the Executive Flight Detachment of HMX-1 provide helicopter transport to the President and Vice President, using the call signs “Marine One” and “Marine Two” respectively. By authority of the 1946 Foreign Service act, the Marine security guards of the Marine Embassy Security Command provide security for American embassies, legations, and consulates at over 110 posts worldwide. At its founding, the Marine Corps was composed of infantry serving aboard naval vessels and was responsible for the security of the ship and her crew by conducting offensive and defensive combat during boarding actions, and defending the ship’s officers from mutiny; to the latter end, their quarters on ship were often strategically positioned between the officers’ quarters and the rest of the vessel. Continental Marines were also responsible for manning raiding parties, both at sea and ashore. America’s first amphibious assault landing occurred early in the Revolutionary War as the Marines gained control of a British ammunition depot and naval port in New Providence, Bahamas. The role of the Marine Corps has since expanded significantly; as the importance of its original naval mission declined with changing naval warfare doctrine and the professionalization of the Naval service, the Corps adapted by focusing on what were formerly secondary missions ashore. The Advanced Base doctrine of the early 20th century codified their combat duties ashore, outlining the use of Marines in the seizure of bases and other duties on land to support naval campaigns. The Marines would also develop tactics and techniques of amphibious assault on defended coastlines in time for use in World War II. Its original mission of providing shipboard security finally ended in the 1990s, when the last Marine security detachments were withdrawn from U.S. Navy ships. While the Marine Corps does not employ any unique combat arms, as a force it has the unique ability to rapidly deploy a combined-arms task force to almost anywhere in the world within days. The basic structure for all deployed units is a Marine Air-Ground Task Force (MAGTF) that integrates a ground combat element, an aviation combat element, and a logistics combat element combat component under a common command element. While the creation of joint commands under the Goldwater-Nichols Act has improved inter-service coordination between the U.S. military services, the Corps’ ability to permanently maintain integrated multi-element task forces under a single command provides a smoother implementation of combined-arms warfare principles. This focus on the infantry is matched with the doctrine that “Every Marine is a rifleman,” a focus of Commandant Alfred M. Gray, Jr., emphasizing the infantry combat abilities of every Marine. All enlisted Marines, regardless of military specialization, receive training as a rifleman; all officers receive training as infantry platoon commanders. The value of this culture has been demonstrated many times throughout history. For example, at Wake Island, when all of the Marine aircraft were shot down, pilots continued the fight as ground officers, leading supply clerks and cooks in a final defensive effort. 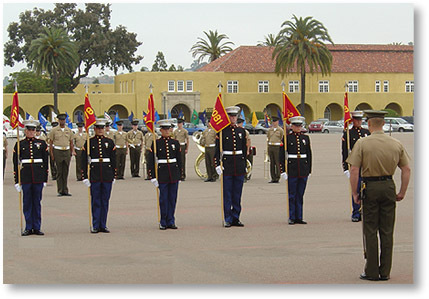 As a result, a large degree of initiative and autonomy is expected of junior Marines, particularly the NCOs, (corporals and sergeants), as compared with many other military organizations. The Marine Corps emphasizes authority and responsibility downward to a greater degree than the other military services. Flexibility of execution is implemented via an emphasis on “commander’s intent” as a guiding principle for carrying out orders; specifying the end state but leaving open the method of execution. The amphibious assault techniques developed for World War II evolved, with the addition of air assault and maneuver warfare doctrine, into the current “Operational Maneuver from the Sea” doctrine of power projection from the seas. The Marines are credited with the development of helicopter insertion doctrine and were the earliest in the American military to widely adopt maneuver-warfare principles, which emphasize low-level initiative and flexible execution. The U.S. Marine Corps relies on the U.S. Navy for sealift to provide its rapid deployment capabilities. In addition to basing a third of the Marine Corps Operating Forces in Japan, Marine Expeditionary Units (MEU) are typically stationed at sea. This allows the ability to function as first responders to international incidents. The U.S. Army now maintains light infantry units capable of rapid worldwide deployment, but those units do not match the combined-arms integration of a MAGTF, and lack the logistics that the Navy provides. For this reason, the Marine Corps is often assigned to non-combat missions such as the evacuation of Americans from unstable countries and humanitarian relief of natural disasters. In larger conflicts, Marines act as a stopgap, to get into and hold an area until larger units can be mobilized. The Corps performed this role in World War I, and the Korean War, where Marines were the first significant combat units deployed from the United States and held the line until the country could mobilize for war. The United States Marine Corps traces its institutional roots to the Continental Marines of the American Revolutionary War, formed at Tun Tavern in Philadelphia, by a resolution of the Second Continental Congress on November 10, 1775 to raise 2 battalions of Marines. That date is regarded and celebrated as the date of the Marine Corps’ “birthday”. At the end of the American Revolution in 1783, both the Continental Navy and Continental Marines were disbanded, and although individual Marines were enlisted for the few American naval vessels left, the institution itself would not be resurrected until 1798. In that year, in preparation for the Naval War with France, Congress created the United States Navy and Marine Corps. The Marines’ most famous action of this period occurred during the First Barbary War (1801–1805) against the Barbary pirates, when William Eaton and First Lieutenant Presley O’Bannon led seven Marines and 300 mercenaries in an effort to capture Tripoli. Though they only reached Derna, the action at Tripoli has been immortalized in the Marines’ hymn and the Mameluke Sword carried by Marine officers. During the War of 1812, Marine naval detachments took part in the great frigate duels that characterized the war, which were the first American victories in the conflict. Their most significant contributions were delaying the British march to Washington, D.C. at the Battle of Bladensburg and holding the center of Gen. Andrew Jackson’s defensive line at the defense of New Orleans. By the end of the war, the Marines had acquired a well-deserved reputation as expert marksmen, especially in ship-to-ship actions. After the war, the Marine Corps fell into a depression that ended with the appointment of Archibald Henderson as its fifth commandant in 1820. Under his tenure, the Corps took on expeditionary duties in the Caribbean, the Gulf of Mexico, Key West, West Africa, the Falkland Islands, and Sumatra. Commandant Henderson is credited with thwarting President Jackson’s attempts to combine and integrate the Marine Corps with the Army. Instead, Congress passed the Act for the Better Organization of the Marine Corps in 1834, stipulating that the Corps was part of the Department of the Navy as a sister service to the U.S. Navy. This would be the first of many times that the existance of the Corps was challenged. With their vast service in foreign engagements, the Marine Corps played a moderate role in the Civil War (1861–1865); their most prominent task was blockade duty. As more and more states seceded from the Union, about half of the Corps’ officers also left the Union to join the Confederacy and form the Confederate States Marine Corps, which ultimately played little part in the war. The battalion of recruits formed for the First Battle of Bull Run (First Manassas) performed poorly, retreating with the rest of the Union forces. The remainder of the 19th century was marked by declining strength and introspection about the mission of the Marine Corps. The U.S. Navy’s transition from sail to steam put into question the need for Marines on naval ships. Meanwhile, Marines served as a convenient resource for interventions and landings to protect American lives and interests overseas. The Corps was involved in over 28 separate interventions in the 30 years from the end of the American Civil War to the end of 19th century. They would also be called upon to stem political and labor unrest within the United States. Under Commandant Jacob Zeilin’s tenure, Marine customs and traditions took shape: the Corps adopted the Marine Corps emblem on November 19, 1868. It was also during this time that “The Marines’ Hymn” was first heard. Around 1883, the Marines adopted their current motto “Semper Fidelis” (Latin: Always Faithful). During the Spanish–American War (1898), Marines led U.S. forces ashore in the Philippines, Cuba, and Puerto Rico, demonstrating their readiness for deployment. At Guantánamo Bay, Cuba, the Marines seized an advanced naval base that remains in use today. Between 1899 and 1916, the Corps continued its record of participation in foreign expeditions, including the Philippine-American War, the Boxer Rebellion in China (1899–1901), Panama, the Cuban Pacifications, the Perdicaris Incident in Morocco, Veracruz, Santo Domingo, and the Banana Wars in Haiti and Nicaragua; the experiences gained in counter-insurgency and guerrilla operations during this period were consolidated into the Small Wars Manual. During World War I veteran Marines served a central role in the late American entry into the conflict. Unlike the U.S. Army, the Marine Corps had a deep pool of officers and NCOs with battle experience, and experienced a relatively smaller expansion. Here, the Marines fought their famed battle at Belleau Wood, creating the Marines’ reputation in modern history. While its previous expeditionary experiences had not earned it much acclaim in the Western world, the Marines’ fierceness and toughness in France earned them the respect of the Germans, who rated them of stormtrooper quality. Though Marines and American media reported that Germans had nicknamed them Teufel Hunden as meaning “Devil Dogs,” there is no evidence of this in German records (as Teufelshunde would be the proper German phrase), it was possibly American propaganda. Nevertheless, the name stuck. The Corps had entered the war with 511 officers and 13,214 enlisted personnel, and by November 11, 1918 had reached a strength of 2,400 officers and 70,000 men. Between the World Wars, the Marine Corps was headed by Commandant John A. Lejeune, and under his leadership, the Corps presciently studied and developed amphibious techniques that would be of great use in World War II. Many officers, including Lt. Col. Earl Hancock “Pete” Ellis, foresaw a war in the Pacific with Japan and took preparations for such a conflict. Through 1941, as the prospect of war grew, the Corps pushed urgently for joint amphibious exercises and acquired amphibious equipment that would prove of great use in the upcoming conflict. US Marines on Iwo Jima raise the American flag. In World War II, the Marines played a central role in the Pacific War. The battles of Guadalcanal, Tarawa, Cape Gloucester, Saipan, Peleliu, Iwo Jima, and Okinawa saw fierce fighting between U.S. Marines and the Imperial Japanese Army. During the battle of Iwo Jima, photographer Joe Rosenthal took the famous photograph Raising the Flag on Iwo Jima of five Marines and one Navy Corpsman raising the American flag on Mt. Suribachi. Secretary of the Navy James Forrestal, having come ashore earlier that day, said of the flag raising, “…the raising of that flag on Suribachi means a Marine Corps for the next five hundred years.” The acts of the Marines during the war added to their already significant popular reputation. By war’s end, the Corps expanded from two brigades to six divisions, five air wings, and supporting troops, totaling about 485,000 Marines. In addition, 20 defense battalions and a parachute battalion were set raised. Nearly 87,000 Marines were casualties during World War II (including nearly 20,000 killed), and 82 were awarded the Medal of Honor. Despite Secretary Forrestal’s prediction, the Corps faced an immediate institutional crisis following the war. Army generals pushing for a strengthened and reorganized defense establishment also attempted to fold the Marine mission and assets into the Navy and Army. Drawing on hastily assembled Congressional support, the Marine Corps rebuffed such efforts to dismantle the Corps, resulting in statutory protection of the Marine Corps in the National Security Act of 1947. Shortly afterward, in 1952 the Douglas-Mansfield Bill afforded the Commandant an equal voice with the Joint Chiefs of Staff on matters relating to the Marines and established the structure of three active divisions and air wings that remain today. The Korean War (1950–1953) saw the hastily formed Provisional Marine Brigade holding the defensive line at the Pusan Perimeter. To execute a flanking maneuver, General Douglas MacArthur called on Marine air and ground forces to make an amphibious landing at Inchon. The successful landing resulted in the collapse of North Korean lines and the pursuit of North Korean forces north near the Yalu River until the entrance of the People’s Republic of China into the war. Chinese troops surrounded, surprised and overwhelmed the overextended and outnumbered American forces. X Corps, which included the 1st Marine Division and the Army’s 7th Infantry Division, regrouped and inflicted heavy casualties during their fighting withdrawal to the coast, now known as the Battle of Chosin Reservoir. Marines would continue a battle of attrition around the 38th Parallel until the 1953 armistice. The Korean War saw the Corps expand from 75,000 regulars to a force of 261,000 Marines, mostly reservists. 30,544 Marines were killed or wounded during the war and 42 were awarded the Medal of Honor. The Marine Corps served an important role in the Vietnam War taking part in such battles as Da Nang, Hue City, and Khe Sanh. Individuals from the USMC operated in the Northern I Corps Regions of South Vietnam. While there, they were constantly engaged in a guerilla war against the National Front for the Liberation of South Vietnam (NLF) and an intermittent conventional war against the North Vietnamese Army (NVA). Portions of the Corps were responsible for the less-known Combined Action Program (CAP) that implemented unconventional techniques for counter-insurgency and worked as military advisors to the Republic of Vietnam Marine Corps. Marines were withdrawn in 1971, and returned briefly in 1975 to evacuate Saigon and attempt a rescue of the crew of the Mayagüez. Vietnam was the longest war for Marines; by its end, 13,091 were killed in action, 51,392 were wounded, and 57 Medals of Honor were awarded. Due to policies concerning rotation, more Marines were deployed for service during Vietnam than World War II. After Vietnam, the Marines resumed their expeditionary role, participating in the 1980 Iran hostage rescue attempt Operation Eagle Claw, the invasion of Grenada (Operation Urgent Fury) and the invasion of Panama (Operation Just Cause). On October 23, 1983, the Marine headquarters building in Beirut, Lebanon, was bombed, causing the highest peacetime losses to the Corps in its history (220 Marines and 21 other service members of the 24th Marine Expeditionary Unit were killed) and leading to the American withdrawal from the country. The year of 1990 saw Marines of the Joint Task Force Sharp Edge save thousands of lives by evacuating the British, French and American Nationals from the violence of the Liberian Civil War. During the Persian Gulf War (1990–1991), Marine task forces formed the initial core for Operation Desert Shield, while U.S. and Coalition troops mobilized, and later liberated Kuwait in Operation Desert Storm. U.S. Marines participated in combat operations in Somalia (1992–1995) during Operations Restore Hope, Restore Hope II, and United Shield to provide humanitarian relief. Following the September 11, 2001 attacks President George W. Bush announced a War on Terrorism. The stated objective of the Global War on Terror is “the defeat of Al-Qaeda, other terrorist groups and any nation that supports or harbors terrorists”. Since then, the Marine Corps, alongside other military and federal agencies, has engaged in global operations around the world in support of that mission. Marines and other U.S. forces began staging in Pakistan and Uzbekistan on the border of Afghanistan as early as October 2001 in preparation for Operation Enduring Freedom. The 15th and 26th Marine Expeditionary Units were the first conventional forces into Afghanistan in support of Operation Enduring Freedom in November 2001, and in December, the Marines seized Kandahar International Airport. Since, then Marine battalions and squadrons have been rotating through, engaging Taliban and Al-Qaeda forces. In 2002, Combined Joint Task Force – Horn of Africa (CJTF-HOA) was stood up at Camp Lemonier to provide regional security. Despite transferring overall command to the U.S. Navy in 2006, the Marines have continued to operate in the Horn of Africa into 2007. Most recently, the Marines have served prominently in the Iraq War. The I Marine Expeditionary Force, along with the Army’s 3rd Infantry Division, spearheaded the 2003 invasion of Iraq. During the occupation of Iraq, Marines spearheaded both assaults on the city of Fallujah in April (Operation Vigilant Resolve) and November 2004 (Operation Phantom Fury). Their time in Iraq has also courted controversy with the Haditha incident and the Hamdania incident. They currently continue to operate throughout Iraq.